Most of us couldn't have predicted that one day, so much of our lives would be public. Young adults growing up in the early days of social media hadn't yet learned that posting online is like carving in stone -- that photo of you and friends celebrating spring break is mighty hard to erase. Even today, the permanent nature of our lives online doesn't always sink in. Only 9% of teenage social media users have concerns about the privacy of their data, according to Pew Research Center. Meanwhile, social media use among teens is skyrocketing -- 92% of teens report going online daily - including 24% who say they go online "almost constantly" (Pew Research, 2015). It's important for young adults to remember that social networks may seem private, but are indeed public. There are consequences for what you post, even if your intentions aren't malicious. Since the internet never sleeps -- or forgets -- personal branding should start early. If young adults begin cultivating their brands in high school, their online reputations will grow positively and strengthen over time. Fortunately, an increasing number of high schools and colleges offer career management courses that embrace personal branding. In a recent blog, I discussed North Broward Prep, a private high school in Florida that requires all high school students to enroll in a personal branding course. Shortly after publishing the blog, the class' instructor, Jason Shaffer, and I connected. What followed was a number of emails, phone conversations, and an in-person visit to his classroom. What Jason shared was fascinating and reinforces my belief that this class should be offered in high schools nationwide. Personal Branding and Digital Communication has been in place at North Broward since summer 2012. The course has evolved over time but the message has remained the same. Identify your passions, stick to your moral code, focus on your goals and tell your personal story through a variety of social platforms. Today, Jason's curriculum is rich with interactive exercises focused on matching your passions with your online identity. One of his favorite teaching tools? Music. "A teen's language is music," Jason says. "Music allows them to express their identity. There's no better way to chronicle the stories of their lives." Once this, and a series of other self-discovery exercises are complete, students build a digital portfolio across various social media sites like About.me, Twitter, LinkedIn, and YouTube. Jason encourages students to leverage brand assets, like photos and logos. Students are also advised to showcase their passions, backstory, extracurricular activities, and accomplishments. And of course, Jason's curriculum includes social media best practices. "Kids should be smart about using social media," Jason explains. "It's more essential than ever to start this conversation young." Shortly before visiting Jason's classroom, I had a serendipitous moment: I watched a local news segment about high school curricula not meeting students' needs. Funny, I thought. I'm about to visit a course doing just the opposite -- empowering and equipping students for the years ahead. 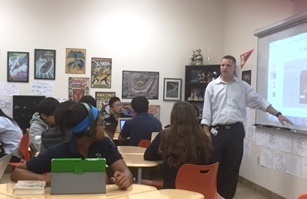 It's no surprise Jason recently won the Meritas Excellence in Teaching award and North Broward's Soaring Eagle award. Jason is a visionary who understands that a clear, clean, and powerful brand can land a student at a top college and entice prospective employers. Samantha Alyce Hreschak, 16 years old, signs every email "Branding Ambassador" and "Artist." Samantha took Jason's class as a sophomore (she's now a junior), and notes the experience was life-changing. "The course helped me pinpoint my passions," Samantha says. She has many: cooking, acting, and art. At the top of the list is stop motion animation. In 10 years, she'd like to work for a company that specializes in animation. To say that Samantha is a fan of the class is an understatement. She continues to work closely with Jason as a Brand Ambassador. And Samantha hopes North Broward introduces further personal branding classes to help bolster students' internship and job interview skills. "Before, I always thought personal branding was simply adding a logo," Samantha says. "But now I know: It's extremely competitive out there, and taking the extra step to develop your personal brand will pay off -- from getting accepted into college to landing the perfect job." Samantha walks the walk. Currently, she has a website, About.me page, YouTube channel, blog, and LinkedIn. Naturally, I had to round out my reporting by speaking with Heidi Teplitz, Director of College Advising at North Broward. "Not everyone can get into Harvard, but we want everybody to get into their Harvard," Heidi told me. Indeed, the competition is fierce: More than 200,000 high school seniors graduated with a flawless GPA last year. About 3,000 students achieved 2200-plus on the SAT, and Harvard turned away 200 applicants with a perfect 2400 score. Personal branding is more than just an online profile -- it's a holistic picture that appeals to college admission officers. "Every campus has a unique culture," Heidi says. "They are building a community and want to ensure that incoming students will be an asset. Beyond traditional GPAs and test scores, they are seeking students who are engaged in and out of school, who have leadership skills, and who have a passion for learning." "What students post online must be a very thoughtful process -- and the Personal Branding class at North Broward instills 14 year olds with an important life skill," Heidi continues. "It teaches them to think before they post, and allows them to make ethical decisions that will impact them for years to come."